Over a month ago, DH and I went to Los Banos, Laguna to accompany our daughter Karen to her UPCAT review at Brain Train. As the review was scheduled from morning til afternoon, DH and I went to the gardens in LB for a look-see. We bought a couple of forget-me-not's and a couple of small plants with blue flowers that the vendor could not definitely identify. When we got home, DH set them at a side of the garden. Here are the "mother" plants. One day, the plants got hit by a piece of plywood that got blown by storm winds and many of the branches broke! DH thought it was a long shot but decided to replant the broken branches as cuttings anyway. Imagine our surprise when the cutting not only lived but actually yielded flowers almost immediately! They're so easy to propagate. And here are the flower-bearing newly-planted cuttings. Thanx to the kind folks at gardenweb, these are now positively identified as Evolvulus glomeratus or Blue Daze. A tender perennial that is winter hardy to USDA Zones 9 to 11. In the St. Louis area, it is grown as an annual in hanging baskets and containers or in the ground as a bedding plant or ground cover. Starter plants are often available from local nurseries in cell packs in spring. Cuttings may be taken from established plants in summer for overwintering indoors in bright but cool locations with reduced watering. Blue daze is an evergreen subshrub that grows in a low, spreading mound, up to 2-3 ft in diameter, but no more than 1 ft tall. The stems become woody as they age. Leaves and stems are densely downy, covered with a light gray fuzz. The egg shaped leaves are about a 0.5 in wide and 1 in long. The funnel shaped flowers are born individually in leaf axils near the stem tips. They are about 1 in across, with five pale lavender or powder blue petals and white throats. Evolvulus blooms profusely and almost continuously, but each flower lasts only a day, opening in the morning and closing by afternoon. 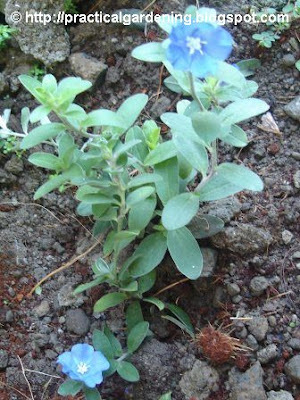 The cultivar, 'Blue Daze' is widely available. Evolvulus glomeratus is native to Brazil and Paraguay. This plant is sometimes confused with Evolvulus pilosus / Evolvulus nuttallianus which occurs in midwestern North America from Montana and North Dakota, south through Arizona and Texas.